Embroidering gifts and things for babies is one of the most rewarding projects you can do with your Brother SE400. All the little things that babies need are just so cute that they naturally inspire you to personalize them with embroidery. Personalized gifts are fun to make and especially enjoyable when you see how much parents appreciate them. First, find an appropriate embroidery design for the motif. There are a lot of choices: People like pretty designs and colors for little girls — flowers or princesses or magical things. Stronger colors for boys and sports or games. Animals and cartoon characters are for everyone Now, just as I write this, I’m disturbed by my stereotyping, especially as I wasn’t at all that kind of little girl. So you might want to avoid the common ideas. 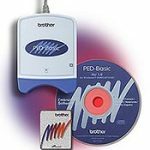 You can find a vast number of embroidery designs on the Internet for free or a reasonable price and easily transfer them into the Brother SE400 via the USB port. You’re sure to find designs to suit any taste and baby. Then, to personalize the design, add the baby’s name or initials, and/or any cute, meaningful, or inspiring saying depending on the type of the item. Bibs are essential for containing the baby’s first messy attempts at feeding themselves. You can either make them yourself or buy plain ones in bright colors ready to embellish. Just stitch the design in the middle and add the baby’s first name. Or for the easiest option, buy bibs with a design you like and just embroider the baby’s name underneath to personalize it. Burp Cloths – In addition to a cute motif relating to milk such as a cow, people love to embroider funny or clever sayings such as “Got Milk” or “Spit Happens.” Or you can simply embroider any design such as a flower or cartoon figure with the baby’s name underneath. Baby towels and washcloths embellished with names, initials or designs. It seems like babies need a lot of clothes — onesies or bodysuites, sleep suits, hats, bootees and socks, dresses and shirts, — the list goes on and on. You could make a complete outfit with coordinated embroidered designs or embroider just one item. People love onesies with funny sayings and unique graphics. To make it special, personalize it by embroidering her name or a slogan like “Daddy’s Little Girl.” Or for a boy, a spots design or a funny saying. If you knit or crochet, you can make adorable little hats. Because they’re so small, the work goes very quickly and it’s a lot of fun. Or buy plain hats and embroider adorable designs on them. Or buy hats with a design you like and just embroider the baby’s name. Booties can be knitted or just embroidered with a tiny motif and initial. Hooded towels are very practical for wrapping the baby in after a bath. Personalize it with his name or initials. Baby or crib blankets give you more room for creative designs. As well as decorative designs, you can add the baby’s name or initials; and/or date of birth and weight and length at birth. Gifts for a new baby are a perfect opportunity for expressing your creativity and wit. In this world of machines and factories, nothing says how much you care like something handmade. I hope this article gave you some good ideas for making your next baby gift extra special by adding your own creative touch. Can the Brother SE400 Do Caps? Hi, I am fairly new to machine embroidery. 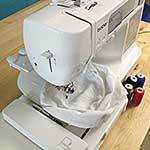 I love my SE400 for sewing and quilting. I am frustrated with my embroidery products. Recently, the bobbin thread is showing on the top of the design with the top thread and the stitching isn’t “thick”. Could you offer any suggestions on what to check? Hi! 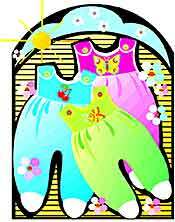 I am having issues embroidery soft fabrics such as baby onesies and baby outfits. I use a stabilizer and turned the tension down but for some reason I can’t get a pretty stitch on these. It comes out pulling the fabric and the stitching is not pretty. I can embroider a vest or blanket with no problem. Help please. Thank you. 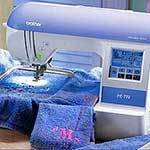 I have a brother embroidery machine cam you use any size hoop with it? Hi, I have had my Brother SE 400 for a while now. But I have only ever purchased designs from the internet that were instant downloads. I was wondering if there was a way to design my own images/text or digitize files to a pes. or dst. format. Is there a way to do this without purchasing expensive software? Can this be done with the SE 400? Hi Bonnie, Yes, as long as the name fits in a 3.94×3.94 inch space. And as long as you can get the part of the shirt you want to embroider under the pressor foot and the rest of the shirt out of the way. So above the pocket will probably work. On the pocket won’t unless you remove the pocket because it would stitch the pocket closed. Back of shirt won’t be large enough. I received a Brother SE400 as a Christmas gift & I have been practicing designs to make some things for my granddaughter. I am having a problem with the bobbin thread tangling & pulling the fabric into the machine. What am I doing wrong? Hi Sharon, usually it’s because it’s not threaded correctly or there is some lint or something in the bobbin case. You are using the correct size bobbin? and bobbin thread? There is a list of causes and page references for solutions in the Operations manual. Have a look at pp. 155, 156. Hi Barb, Thanks for visiting. Do you check out Brother.com. They have a free monthly design and project that might give you more ideas. UrbanThreads.com also has some unusual projects/tutorials. I love that site. Hello. I have the 6800PRW which you said was exactly the same as the Brother SE400. It was my understanding I could only use the 4×4 hoop that was included with the machine. I would like to use the hoops which you indicate can be used with the SE400. Can I use those hoops for the 6800 as well? Thank you so much for your time!! This is my first time using an embroidery machine. Yes, you can use those hoops with the 6800.